Cleveland’s most historic neighborhood is also one of its most captivating. The Flats are full of hidden treasures, from artists laboring in century-old warehouses to one of the largest urban rowing programs in the country. Redevelopment of the area, as evidenced by Flats East and the new Music Box Supper Club, should continue apace as the area benefits from the behind-the-scenes work of the nonprofit Flats Forward, new green spaces and trails, and investment spilling over from downtown. Some worry the area will lose its industrial character. That’s what makes the Flats what they are, and these active businesses are a boon to the economy. As new investors enter the area, expect a healthy tension between the various uses – from nightlife to artists, and from recreation to industry – that take up residence in the Flats. This is the only place in Cleveland, after all, where you can gaze up at giant freighters, historic bridges and the downtown skyline, all while feeling the earth literally shake beneath your feet from a nearby stamping plant. The recent Flats Framework Plan developed by Flats Forward sets the stage for additional development. After a decade of standing still, change is already happening, as evidenced by projects like Brick and Barrel and Merwin’s Wharf. That makes some business owners nervous. “We want to coexist down here, but there has to be a balance between business and other activity,” says Rob Johnson, second-generation owner of Boiler Specialists on Merwin Avenue, a firm that repairs, installs and rents commercial boilers. Johnson quips that his firm's motto could be: We don’t do boilers in houses, we do boilers as big as houses! Conflicts will always exist between industrial businesses and uses like entertainment. Yet Johnson himself may be an example of how a balance can be struck – three nights a week, he walks from work to the Rowing Foundation's boathouse at Rivergate Park, where he's joined a masters rowing team. Allow Fresh Water to take you on a whirlwind tour of five projects – both big and small – that are reshaping the Flats. 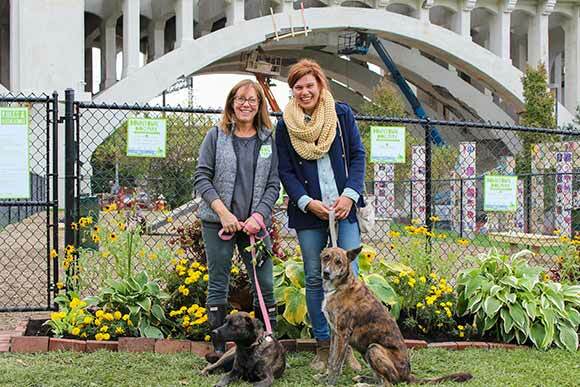 In an effort to make downtown and the Flats more livable and offer amenities for pet owners, Downtown Cleveland Alliance spearheaded a campaign to build a dog park on land owned by RTA near Settlers Landing on the Flats' east bank. That campaign is now complete, having raised more than $10,000 through crowdfunding, and the dog park is open. Based on the enthusiastic crowd of canines and owners at the ribbon cutting, there’s certainly demand. Downtown Cleveland now has more than 12,500 people and over 1,000 registered dogs. The 4,500 square foot dog park is lined with pea gravel and enclosed by fencing and a gated entrance. There are benches for humans and a play structure for dogs. So we can now say that downtown has green spaces for people and their four-legged friends. One of the best views of Cleveland can be had while rowing down the Cuyahoga River in an eight-person shell. If you’re into thrills, it doesn’t get much better than passing an 800 foot ore boat as you glide though the water at breakneck speed. 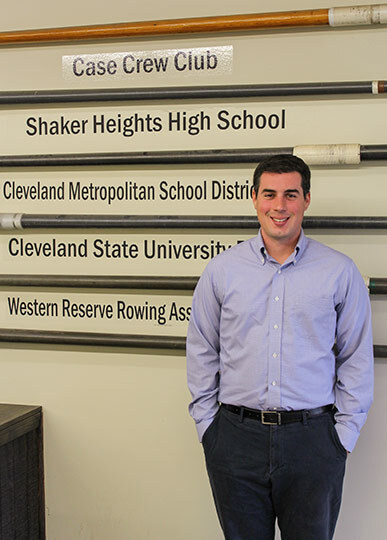 The Cleveland Rowing Foundation, which occupies a renovated warehouse on the old Commodore Club property (now Rivergate Park), has doubled in size in the past three years. Director Kirk Lang says that while there were just 750-800 members before they moved, the club now boasts 1,400-1,500 members. It doesn’t hurt that rowing on the crooked river, which is famously tight in spots, is great exercise and a whole lot of fun. There’s an economic development spinoff, too – after a night of rowing, participants hit local pubs like the Flat Iron and Hoopples. CRF has added several high schools and colleges to the roster, including the Cleveland Metropolitan School District. High schools are particularly interested in rowing programs because they’re popular with students, and because there’s more college scholarship money available for rowing than other sports. What's next for CRF? Signing a deal to launch a varsity rowing program with one of the area colleges (they're close, Lang says) and a new boathouse. This week, the group will seek permission from the Cleveland Planning Commission to build a temporary structure, then they'll add showers and lockers to their current building. Over the long term, the group envisions a signature new boathouse. “We have one of the largest one-day, learn-to-row adult programs in the country,” boasts Lang, who says the docks are humming nearly every night of the week. DCA has announced plans to take over the former Flats Oxbow building, a historic property near Heritage Park that was originally built a century ago to house a fire department training academy. The building, located at 1283 Riverbed Street, has some pretty cool features, including a brick exterior, clay tile roof and a tower with a rack where firemen once hung their hoses to dry. The building will be renovated as the future home of Flotsam and Jetsam, vessels that the Port uses to clean the river. Currently, the boats are housed at Edgewater Park and must travel an hour each way. DCA, which manages the downtown Business Improvement District, will also manage the boats for the Port. 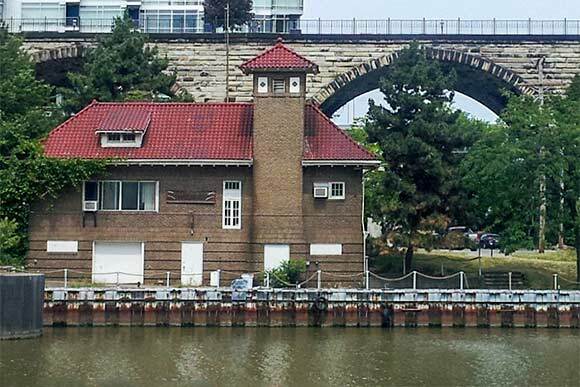 “With the positioning of Flotsam and Jetsam on the Cuyahoga River, the crews will be able to increase the amount of debris removed from the river,” says Flats Forward/DCA spokesperson Melinda Gigante. Moreover, the DCA Ambassadors that are employed through the downtown Clean & Safe Program will begin operating from the building, as well. Finally, it will be used as community meeting space and secondary offices for Flats Forward. Flats Forward is still in the preliminary stages with this project and has not yet begun fundraising for renovations, which are likely to cost $150,000-250,000. Did you know that the artists and community groups behind Parade the Circle create their masks, larger-than-life puppets and other artwork in an old brick warehouse on Columbus Road? Neither did we! So we had to take a tour. The building is magical -- it has wrought-iron gates leading to a Venetian-style alley; a workspace stuffed full of giant masks, woodworking equipment and industrial sewing machines; and a secret brick courtyard with an oak tree. 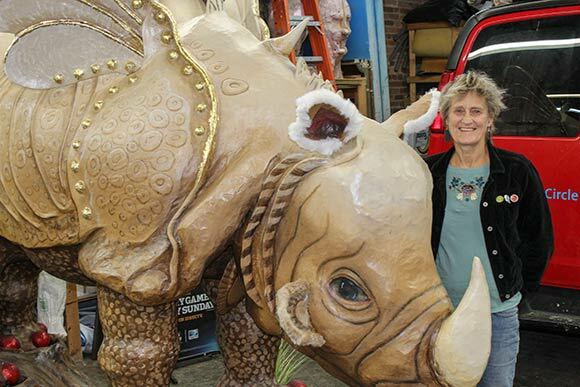 Robin Van Lear, Director of Community Arts for CMA, explains that the department runs three main programs – Parade the Circle, the Chalk Festival and the Winter Lights Lantern Festival at Holiday CircleFest. The building in the Flats is used to build large-scale community art, and as a meeting space. Van Lear says the building is inspiring. “I now appreciate artists like Charles Demuth who painted industrial scenes,” she says. Recently, Clevelanders celebrated the opening of Rivergate Park, completion of Scranton Flats, and improvements to Edgewater Park and other lakefront parks. Next year, we’ll be able to add another one to the list. The first section of the Lake Link Trail, which will begin at the Scranton Flats section of the Towpath and hug an old railroad right of way to Irishtown Bend, will be done next year. The Metroparks recently selected a contractor, and the project will break ground soon. Phase II of the Lake Link Trail, expected to be done in 2016, will follow Riverbed Road, head under the historic viaduct, burrow below grade through the west bank, and soar over an iconic, new pedestrian bridge to Whiskey Island. The project, which finally connects Whiskey Island to downtown, also repurposes a piece of our industrial heritage. The old railroad right-of-way still has the historic stone walls and abutments that once supported the tracks, and they'll be reused. For example, where the trail spans Scranton Road, the new bridge will be mounted to the old abutment (as shown in the photograph at the top). 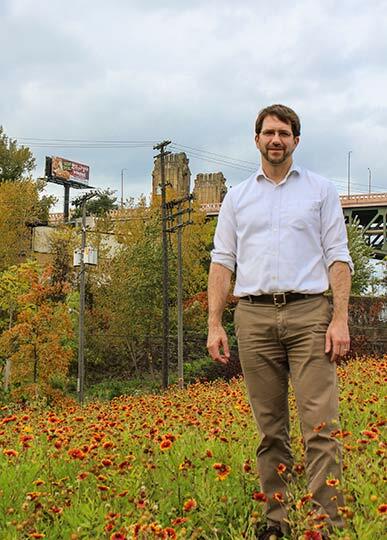 “It could handle a thousand elephants if it had to,” says Joel Wimbiscus, Project Manager with LAND Studio, the nonprofit spearheading the project along with the Metroparks, Trust for Public Land, the city and the Wendy Park Foundation. The project is part of a larger, $30 million effort called Connecting Cleveland that has garnered large grants from the Cleveland and Gund Foundations. "It's massive stone." Further along, the stone walls that once held the tracks will become an interesting architectural detail for bikers and hikers traveling the 10-foot paved trail. The trail will pass within a block of Riverview, the large public housing project in Ohio City that contains over 2,000 residents but is physically isolated. Planners say the trail will offer low-income residents access to recreation and green space. At the trail's end, travelers will be able to glance back before crossing the bridge to Whiskey Island – and they’ll catch the most glorious of Cleveland views, the industrial Flats with the bridges and downtown skyline in the background.